Steve Jordan is One of The Best Button Box Accordionist Ever! JORDAN, ESTEBAN [STEVE] (1939–2010). Esteban “Steve” Jordan, Conjunto accordionist and multi-instrumentalist, was born in Elsa, Texas, on February 23, 1939. 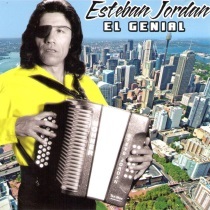 Jordan is best-known for his innovative style of accordion playing in which he blended traditional Mexican folk music with blues, jazz, and rock-and-roll. Esteban Jordan began playing accordion at age seven after hearing conjunto legend Valerio Longoria perform. When he was a teenager, Jordan took four of his brothers out of the fields and taught each one to play an instrument. He then started his own band, Los Hermanos Jordan. As time passed and his musical abilities progressed, Jordan relocated to San Jose, California, in 1958. That same year, he met his future wife, mariachi singer Virginia Martínez, at a Mexican Independence Day concert at Phoenix Municipal Park baseball stadium in South Phoenix. Throughout the early 1960s, Jordan and Martínez recorded and toured the “taco circuit” together. His early recording, “Squeeze-box Man,” became a regional hit. Jordan was based out of Phoenix throughout the 1960s. The 1960s and 1970s proved to be transformational for Jordan, as he began to play rock-and-roll and jazz guitar with such high profile musicians as Willie Bobo’s Latin Jazz band in 1964. During the late 1960s Jordan earned the nickname “the Jimi Hendrix of the accordion,” after introducing psychedelic phase shifters to an instrument (he played a traditional button accordion) which had long been associated with more traditional German, Czech, and Mexican folk music. In the early 1970s Jordan performed alongside such well-known rock musicians as Carlos Santana, the Grateful Dead’s Jerry Garcia, and Poncho Sanchez. As Jordan became increasingly drawn to rock and jazz, he blended together elements from both genres, along with country, zydeco, and Cajun, to create a truly unique accordion style. In the early 1970s Jordan returned to his native Texas, where he recorded several hits, including “El Corrido de Johnny el Pachuco” and “El Piedrecita.” Throughout the 1980s, Jordan garnered critical acclaim. In 1982 he was inducted into the Conjunto Music Hall of Fame, making him one of the first inductees and, at forty-three years old, one of the youngest. He signed with RCA in 1985 and recorded the album “Turn Me Loose” (1986) which received a Grammy® nomination for Best Mexican-American Performance. He appeared in musician David Byrne’s film “True Stories” (1986). In 1987 comedian Cheech Marin (of Cheech and Chong fame) used Jordan’s music for his film, “Born in East L.A”. In 1988 Jordan played at the Berlin Jazz Festival and was recruited by the Hohner Accordion Company to design the “Steve Jordan Tex-Mex Rockordeon.” He later recalled that a personal performance highlight occurred when he played his new accordion for the assembly workers at the Hohner factory in Germany. Jordan received accolades for his innovation on the accordion, including induction into the Texas Conjunto Music Hall of Fame in 2001 and the Tejano R.O.O.T.S. Hall of Fame in 2003. Jordan spent the final years of his life in San Antonio, performing most Friday nights at the Saluté International Bar with his band, Rio Jordan, which featured two of his sons, Esteban Jordan III on guitar and Ricardo Jordan on bass. In 2009 Hohner USA honored Jordan with a reissue of the Steve Jordan Rockordeon. During his career Jordan recorded more than twenty-five albums on such labels as Falcon, Omega, ARV, Freddie, Hacienda, and his own El Parche label. He was featured in the Bob Bullock Texas State History Museum’s “Sabor Latino” exhibit which opened in February 2010. Esteban “Steve” Jordan died of liver cancer on August 13, 2010, at his home in San Antonio. In the last year of his life, Jordan self-released “Carta Espiritual”, the first of a projected nine album series he had been working on for more than a decade. We at PolkaConnection.com highly recommend this CD by Esteban “Steve” Jordan. This is one of Steve’s Jordan’s Best CDs! Steve Jordan presents “El Genial” (The Great). Don't pass this CD today!